Posted on 29, September 2016 by EuropaWire PR Editors | This entry was posted in Awards, Industrial, Sweden, Transportation & Logistics and tagged Guido Beaujean, Hiab, Lotta Sjöberg, Martin Utpatel, Sören Hansen, Sven Aage Hansen, Tim Hansen, World Crane Championships. Bookmark the permalink. 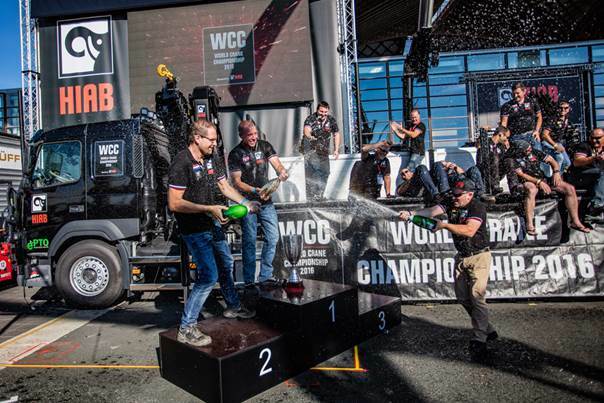 Malmö, Sweden, 29-Sep-2016 — /EuropaWire/ — Hiab, part of Cargotec, is delighted to announce that Tim Hansen from Denmark has won the World Crane Championships (WCC) held on 24 and 25 September in connection to the IAA exhibition in Hannover, Germany. In the finals, the crane drivers got to operate the cutting-edge HIAB X-HiPro 232 mid-range loader crane just launched at the IAA. The competition tested the contestants’ skills and ability to clear a series of precision obstacles at maximum speed. “I have been nervous from the start,” Mr Hansen commented after the race. Tim Hansen has his own company, Tim Hansen APS, and has been operating cranes all his life. It runs in the family: Tim’s grandfather Sven Aage Hansen, aged 82, has driven cranes for over sixty years and father Sören Hansen is also a crane operator. “The best thing about being a crane operator is working in the summer time,” Tim Hansen said with a smile.